Kovind said his government was sensitive to the needs of the common people and understood their pain and prioritised provisions of basic amenities, addressed health concerns of the people and implemented the government schemes at an unprecedented pace after restructuring them. “Lack of toilets had forced crores of Indians, especially our daughters and daughters-in-law to lead an undignified and unhealthy life. Under the Swachh Bharat Abhiyan, more than 9 crore toilets have been constructed," said Kovind. “It is the outcome of this mass movement that coverage of rural sanitation that was less than 40% in 2014, increased to 98%. According to an assessment, because of the toilets built, numerous poor people have been spared of various kinds of diseases and more than 3 lakh lives have been saved." The president highlighted that in the year of the 150th birth anniversary of Mahatma Gandhi, the government resolved in his memory to achieve Swachh Bharat by 2nd October. “Many of our mothers, sisters and daughters used to suffer from various illnesses because of smoke filled kitchens, which also affected health of the entire family; and much of their effort and time were spent in collecting firewood," he said. Kovind said his government had provided more than 6 crore cooking gas connections to rural women under the Ujjwala Yojana. Adding that there were only 12 crore gas connections in the country in 2014, Kovind said that in a short period of four and a half years, 13 crore families were provided gas connections. Mentioning about the most ambitious scheme of Prime Minister Narendra Modi-led government, Ayushman Bharat, launched last year, Kovind said: “Under the world’s biggest health care scheme, ‘Pradhan Mantri Jan Aarogya Abhiyan’, 50 crore poor are eligible for availing treatment up to `5 lakh per year per family in case of a serious illness. In a short period of four months, more than 10 lakh poor have already availed free treatment from hospitals under this scheme." “The government's endeavour has also been to reduce the burden of out-of-pocket expenses on medical care for the poor and the middle class. Under ‘Pradhan Mantri Bharatiya Jan Aushadhi Pariyojana’, 4,900 Jan Aushadhi Centres have already been opened in more than 600 districts. More than 700 different medicines are being dispensed at low cost in these Centres." Similarly, reduction in the cost of cardiac stents resulted annual savings of around `4,600 crore for the poor and middle class, the president said. The reduction in the cost of knee replacement led to an annual saving of about `1,500 crore, he added. “My government has provided the facility of free-of-cost dialysis to those suffering from kidney diseases. This has resulted in a saving of more than `2,000 per session for these people." Kovind pointed out that in addition, for a premium of just `1 a month under the ‘Pradhan Mantri Suraksha Bima Yojana’ and 90 paise a day under the ‘Pradhan Mantri Jeevan Jyoti Bima Yojana’, as many as 21 crore poor people were provided with insurance coverage. An assistance of `2 lakh in the event of an untoward incident is available to them under both the schemes. Kovind talked about health related schemes of his government that have improved the overall health of the people especially, the poor, women and children in rural areas. 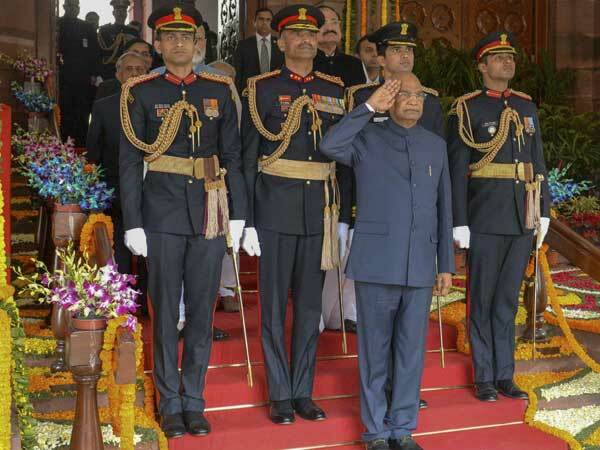 To enable working women to devote more time towards the upbringing of their new born children during their crucial formative years, the Government has enhanced maternity leave from 12 weeks to 26 weeks, said President Kovind. We are fully aware that the burden of expenditure on medical treatment further impoverishes the poor families. Government is working at a fast pace to strengthen the healthcare related infrastructure. New medical colleges are being set up by the Government, district hospitals are being upgraded and Wellness Centres are being established in all major Panchayats of the country. From Madurai in Tamil Nadu to Pulwama in Jammu-Kashmir; and from Rajkot in Gujarat to Kamrup in Assam, new ‘AIIMS’ are being established. Government is setting up new Ayurveda Science Institutes and encouraging yoga for physical and mental well being. To address the shortage of doctors in rural areas, 31 thousand new seats have been added in medical education in the last four years. Government which empathizes with this pain has launched the “Ayushman Bharat Yojana” last year. Under the world’s biggest health care scheme, ‘Pradhan Mantri Jan Aarogya Abhiyan’, 50 crore poor are eligible for availing treatment up to Rs 5 lakh per year per family in case of a serious illness. In a short period of four months, more than 10 lakh poor have already availed free treatment from hospitals under this scheme. The Government has also fast-tracked the construction of houses across cities and villages under the Pradhan Mantri Awas Yojana, in an unprecedented manner. Government has been working towards reforming the legal system so as to ensure social and economic justice. The Citizenship Amendment Bill will help in the securing of Indian citizenship by those victims who were persecuted and were compelled to seek refuge in India. My Government is striving day and night to attain the goal of doubling farmers income. Understanding the needs of farmers, the Government is seeking to find permanent solutions to their problems. It is the priority of the Government to provide better facilities and assistance to farmers for the entire spectrum of agriculture activities from purchase of equipments and seeds to transportation of produce and its sale. The Government has now developed an online platform called GeM i.e. Government e-Marketplace for public procurement. This platform has helped in bringing transparency in public procurement and at the same time has provided an opportunity to entrepreneurs in big and small cities as well as villages to sell their products without any difficulty to the Government. Recently, in order to simplify the processes, the Government has started a scheme wherein loans of amounts up to Rs.1 crore are approved within 59 minutes. Under Jan Dhan Yojana, 34 crore people have opened a bank account & almost every family in the country is connected to the banking system. According to an international agency, 55 per cent of the total bank accounts opened between 2014-2017 were opened in India itself. Demonetisation was a defining moment in the Government’s war on corruption and black money. This decision struck at the very root of the parallel economy thriving on black money; and the money outside the formal system was brought within the ambit of nation’s economy. While preventing the flow of black money abroad, my Government also launched a major campaign against black money within the country. New laws were enacted for sectors thriving on black money, and those were brought under the ambit of taxation. Amid these actions, Government also provided an opportunity to voluntarily disclose unaccounted income and wealth. Assets worth more than Rs 50 thousand crore are being confiscated under the Benami Property Act, Prevention of Money Laundering Act and the law against fugitive economic offenders. As a result of the policies of my Government, black money in real estate sector has declined substantially, the prices of houses have come down and the dream of a normal middle class family for possessing their own house is being realised. People’s trust in the Government has increased, and there has been a sharp increase in the number of persons paying income tax. Whereas prior to 2014, 3.8 crore people had filed their return, this number has increased and more than 6.8 crore people have come forward to file their returns. Today, the tax payer is confident that each paisa contributed by him or her is being spent honestly on nation building. As a result of the expansion in Direct Benefit Transfer in the last four and a half years, more than Rs 6 lakh 5 thousand crore have been directly transferred to the bank accounts of beneficiaries. Because of this, about Rs. 1 lakh 10 thousand crore have been saved from falling into wrong hands. Government has removed about 8 crore fictitious names which were being used by middlemen to misappropriate the rightful benefits of genuine beneficiaries. In order to build a strong nation, it is imperative that we develop our economy in such a manner that will help our fellow citizens to progress with transparency and honesty. Prior to 2014, auction of coal mines used to be a subject of discussion due to lack of transparency. My Government developed a transparent system for auction of coal mines and has protected this national resource. Banks and creditors have directly or indirectly dealt with Rs 3 lakh crore after the new Bankruptcy and Insolvency Code has come into effect. The tendency to avail large loans and misappropriate them with an intent to default has been curbed. With the implementation of a comprehensive tax reform like the GST, the concept of ‘One Nation-One Tax-One Market’ has been realised. GST is proving instrumental in establishing an honest and transparent system of trade and commerce which is also benefitting the country’s youth. This system, while reducing the difficulties faced by traders, has enhanced their ease of doing business across the country. I congratulate my compatriots for wholeheartedly embracing the new system in a short span of time in the interest of a better future for the country, in spite of the initial bottlenecks. My Government is continuously improving the GST regime keeping in view the suggestions being received from the business community. India has emerged as the 6th largest economy in the world. This is an opportune moment for the country to play a decisive role in the 4th industrial revolution and my Government is committed to ensure that our citizens take full benefit of this opportunity. As a result of the ‘Make in India’ initiative effective outcomes in the field of industrial development and employment generation are clearly visible. Now India is the 2nd largest manufacturer of mobile phones in the world. Recently, the milestone of converting diesel locomotives into 10 thousand horsepower electric engines has also been established by India. In order to make the latest technology-based systems available in our cities so that they can become growth engines of the economy, modern facilities are being developed in 100 cities under the Smart City Mission. The nation is moving at a fast pace in the civil aviation sector also. This sector has seen a double digit growth during the last four years. More than 12 crore and 30 lakh people travelled by air during 2017-18 and this number is increasing constantly. This transformation, offers a glimpse of an India on the move. Under the ‘Udan scheme’, 12 lakh seats have been made available to people at lower tariffs. This has provided the common person with an opportunity of air travel. Ganga is not just a river for us but, is like a mother to us, a living symbol of our culture and faith. To keep Ganga clean is our sacred duty. Under the ‘Namami Gange Mission’, projects worth Rs 25,500 crore have been approved so far. My Government is engaged with the task of cleaning up of the river Ganga by diverting dozens of major drains, stopping flow of industrial effluents and by setting up several Sewage Treatment Plants in the cities.